Marc shares some of the events that happened on this day in history, including the death of actor and comedian Bert Williams and the birth of Garrett Morgan, the philanthropist, civil rights leader, and inventor of the red light and gas mask. 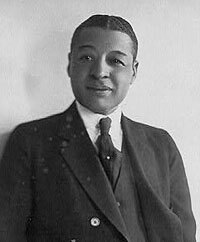 That was the voice of the famous vaudevillian actor and comedian Bert Williams. White comics like Eddie Cantor, who used the Black world to make themselves famous through performing in blackface, called African American comedian Bert Williams a comic genius. Comedian W.C. Fields called him the funniest man in America. For 26 years, Bert Williams was one of America’s top performers. He was born in the Bahamas and was on his way to become a civil engineer, but left to entertain loggers and miners with his comedy, going on the circuit making blackface of his own. He produced Broadway musicals like “Dahomey” and “Son of Ham.” He performed before the King of England and is credited with opening the doors for Black comedians, who he mentored, and those that came after him. He collapsed on stage… and a month later, today in 1922, he died. Three major events happened today in the process of Europeans colonizing this hemisphere. >> Christopher Columbus in 1493 sailed back to Lisbon, the capital of Portugal, with treasures and Native people, who he captured, as a way to convince the King that “this prize” — the New World as he called it — must be taken before others took it. >> Over 20 years later in 1519, Spanish conquistador Hernán Cortés arrived in Mexico in search of gold and the Aztecs. >> And a hundred years after Christopher Columbus’ presentation of treasures from the New World to the King, the Massachusetts Bay Colony was granted a Royal Charter today in 1628. George Henry Wright left Congress today in 1901. He was the last of the post-Reconstruction Black Congressman in office and he was forced out of his position. He remained the last African American to serve in Congress from the South until 1972, over 70 years since he had left office. George Henry Wright’s father was free and prosperous. His mother was enslaved. He studied Latin, math and more, and was an early Howard University graduate. In his last speech in Congress, he attempted to censure Southern states who codified the disenfranchisement of Blacks. He lost his family wealth when his land was taken, and he left for Philadelphia, where he remained active in political life till his death in 1918. And she was the only member of Congress to vote against going to war after the Pearl Harbor attack. Another political women have first today was Francis Perkins. She became the first woman cabinet secretary in 1933 and was appointed by Franklin Delano Roosevelt. Sitting in traffic, you see that red light. Well, yes, it was invented by a Black man, that same man who invented the gas mask. When he saw firefighters struggling to breathe, he created this device that made him famous when he used it spontaneously in 1913 to save men trapped in a tunnel under Lake Erie by donning the masking and plunging into the river. His name is Garrett Morgan and he was a philanthropist and civil rights leader and born today in 1877. Author Ernest Hemingway finished his novel The Old Man and the Sea today in 1952. This book won the Pulitzer Prize a year later. Unfortunately, Hemingway committed suicide in 1961, making The Old Man and the Sea Hemingway’s last major work of fiction created. The American Bible Belt exploded over this comment throughout South and Midwest. Conservative groups staged public burnings of Beatles’ records and memorabilia. Radio stations banned Beatles music, and concert venues cancelled performances. This is “Think For Yourself,” a song from the album Rubber Soul that was released a year before John Lennon made his infamous comment.